Pivolend is "gourmet weekend" with beer in Skopje, R. Macedonia. 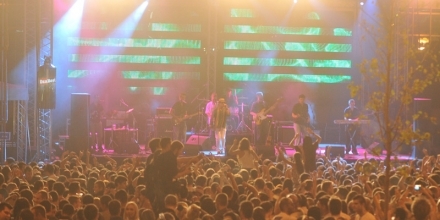 It is an open air festival with a daily capacity of more than 25.000 people. It includes 3 stages with music program from all music genres. Besides music, the festival supports art innovations, beer-drinking challenges and games, variety kinds of food, etc. Pivolend is established in 2008 and it usually lasts from 15th till 19th of September. It's for sure one of the biggest festivals in Macedonia, welcoming more than 150.000 visitors each year. The rich festival line-up always presents a variety of popular music artists from the region, as well as stars from the world's music scene.